Elysian Studios: Style Trend: Statement Necklaces- Are they here to stay? Style Trend: Statement Necklaces- Are they here to stay? "Statement Necklaces" are huge (literally- the bigger, the better!). "Are they here to stay?" Personally, I think the answer is "Yes!" Why are we so obsessed with these big chunky pieces? One: They express our unique fashion sense, and empower us to unapologetically flaunt it! 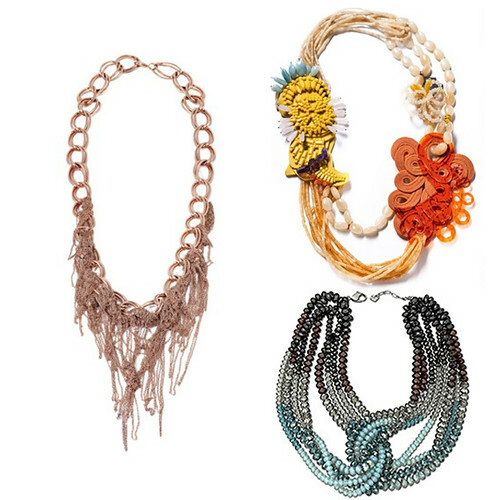 There are a million design possibilities with statement necklaces: color, texture, material, length and drape. We can dramatically display our appreciation for the avant-garde, not to mention having a guaranteed topic of conversation! 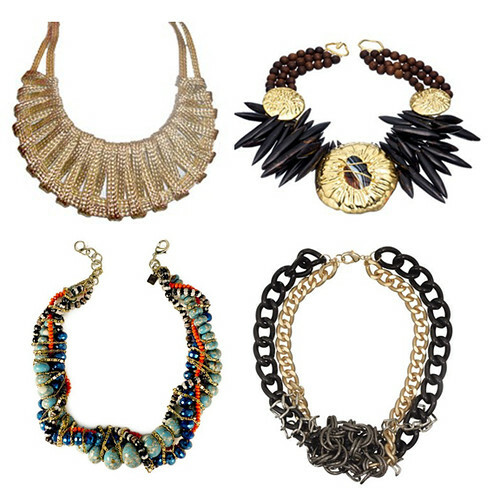 "Statement Necklaces" spark my imagination and get my creative juices flowing! Their construction is fascinating, and their possibilities are endless. Plus, put one on and they're just fun! For my own jewelry, I'm using these examples as beginning references to explore design and materials. I'd love to hear your thoughts on the statement necklace! Do you have any in your wardrobe? Why or why not? Oh yes! I hope so! I love to make statement pieces and find myself struggling to make things that are smallish and dainty. I think that there is a trend to play up your accessories if you can't afford to change your wardrobe as frequently. I also believe that people want to make a statement and stand out from the crowd and this announces you from the start. A lot of what I make qualifies as statement pieces. I am planning to make some for a special gallery exhibit that I am participating in this spring called Vision and Verse where we are interpreting local poets work into our art. I have two big statement pieces planned! Enjoy the day! Some of these are stunning, my mum would definitely like them. I always buy big necklaces but then find them difficult to wear. I agree, Erin, necklaces like these are a way to diversify your current wardrobe for less than it would be to invest in other pieces. Accessories are a visual landing point (as are shoes) and can really make or break your outfit! I agree with Francesca that they can be difficult (more intimidating) to wear, but the key is to not over-think it! I like the idea of statement pieces to different scales. Depending on your frame, you would choose the scale that doesn't overwhelm you. After the minimalist pieces period, I am glad to see the statement pieces back! Love this! I try to make a variety of sizes , like Martha says, it depends on your frame. Here to stay for sure! I love them and I have to design them for clients all the time...so I can see into the jewelry future and yep, here to stay. Love the examples and wardrobe options. Again, loving the new blog layout! Abso-freakin-lutely! And specially great for peeps like me who are a bit cash strapped (read unemployed, oh recession!) but I can invest in some great junk shop/charity shop finds that I cut up and restring as mad statement necklaces that are eco-friendly and one of a kind! Love the outfit look-books too...great idea! Ironically I don't wear a lot of jewelry - I think it comes from all the years of being around small children! I love them on other people though.